The Nokia N73 is the successor to the Nokia N70, the N73 is not yet offically announced but a few details are available on the Internet. The Nokia N73 will come with a 3.2 Megapixel Camera with Carl Zeiss lens and autofocus. 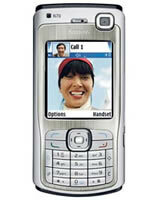 The 3G phone will run on Symbain Operating System and include the Series 60 user interface. The expectation is that device will run on Symbian v9.1 and Series 60 3rd Edition. Other specs include Bluetooth ver 2.0 connectivity, stereo speakers enclosed in a special design. No further information or pictures are available on the Nokia N73.